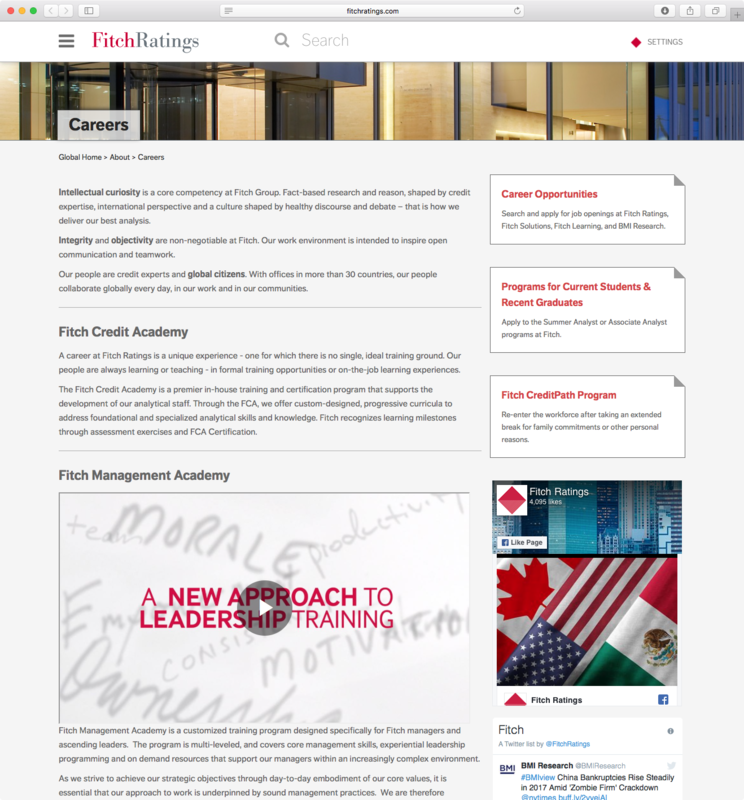 Fitch Ratings hired me to build a new generation of digital customer experience platforms to grow a new market intelligence business powered by credit ratings. I established a global digital and social team, partnered with engineering to redesign and migrate 22 websites to a single, customer-centric platform, and worked with marketing to drive audience growth. I also started the company’s use of podcasting, created new tools to package content using editorial features, video, and data visualization, updated brand and graphic standards, introduced new logo and brand elements designed for digital and social platforms, and built the largest Twitter audience among credit rating agencies. My strategy grew data sales revenue to $150M, and helped push overall revenue past $1B for the first time in the company’s history. To give Fitch Ratings a clear visual identity that could represent the company in a variety of digital applications, especially those where a logotype alone doesn’t work well, I led design of a brand mark that can work equally well alongside the Fitch Ratings logotype, or as a standalone visual mark. The new brand mark is based on a symbol used to mark Fitch’s 100th anniversary in 2013: a red diamond with the number 100. The centennial anniversary reference was replaced with white lined segments in the lower half of the diamond pointing forward and upward, representing the dynamic growth of the company from a pure credit ratings agency to a financial media company with credit ratings at its core. The color difference between the upper and lower halves of the diamond also represents the up and down movement of credit ratings over time. The diamond is used in a lockup with the Fitch Ratings logotype in email campaigns, marketing collateral, and key documents like Fitch’s Code of Ethics. 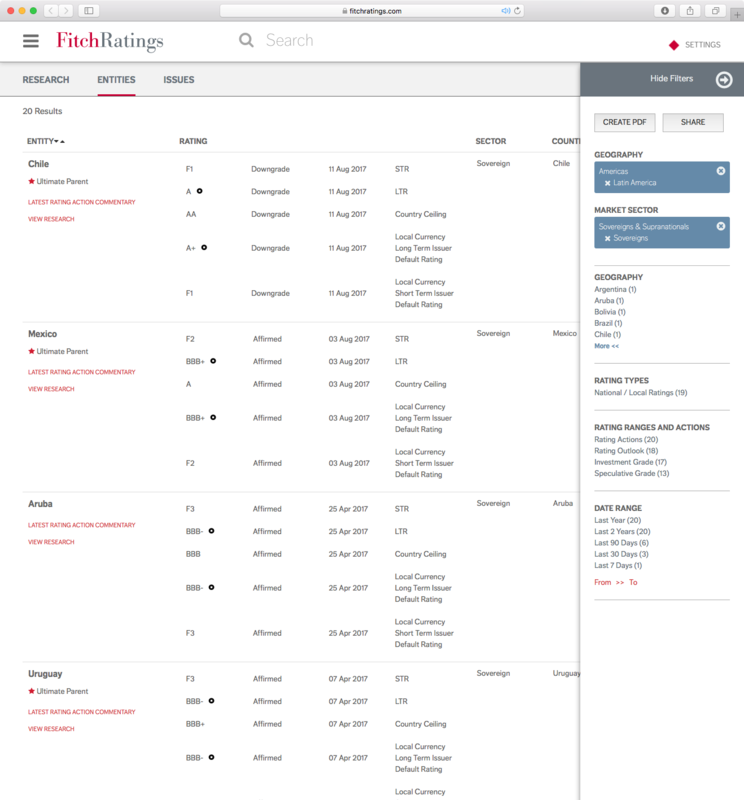 On fitchratings.com, the diamond is used as the visual marker for customer account services, including login, personalization, and communication preferences. On Fitch’s social media channels, the diamond is used by itself for profile images that require a square graphic, need to be abstract and simple enough to reduce well for small screen sizes, and appear alongside the company name in text. I instituted agile project management practices and tools, including JIRA, Confluence, and Bamboo, to move from occasional, large releases to a rolling, four-week development, testing, and release cycle. I also led a design and technical overhaul of Fitch’s technology stack that included database migration from Oracle to Mongo DB, new RESTful APIs, new content management tools, and reusable components that give digital editors better tools to package content for a variety of devices and screen sizes. Throughout the site, information is presented using a layout that’s generously spaced, gracefully responsive to varying screen sizes, and especially easy to use on mobile devices. The header emphasizes navigation, account tools, and search. A single, touch-friendly menu provides an A-Z listing of the market sectors and topics covered by Fitch, which reflects the way our customers have told us they navigate business and market topics. A component-based design system is used to present articles, content streams, and products. These card components are an essential part of the site’s responsive design, and support embedded media, so that video and audio clips, whether hosted on video.fitchratings.com or external platforms like YouTube or SoundCloud, can be played without leaving the page. 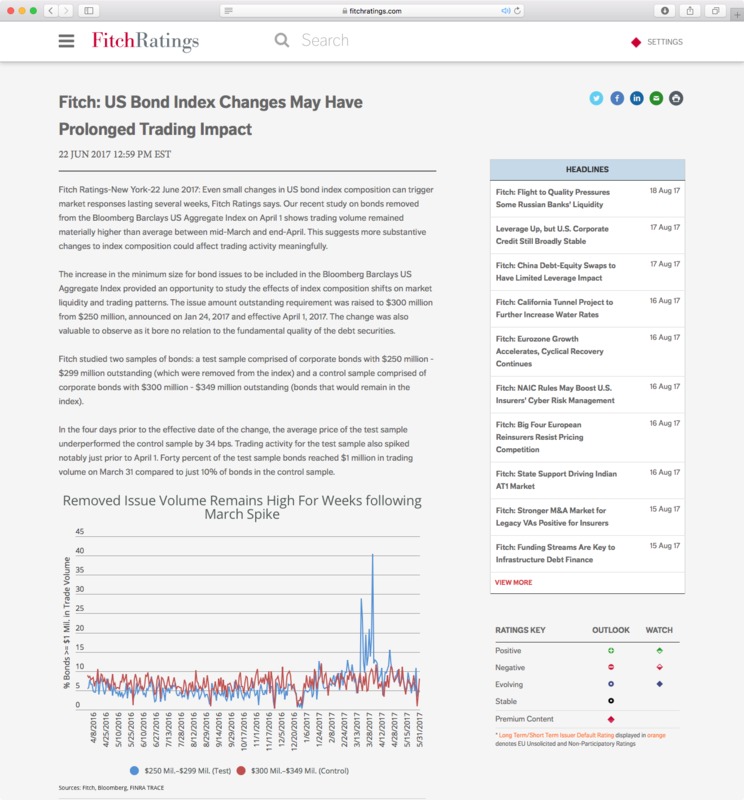 These heavily-used ratings announcements, research notes, and financial market commentaries have been redesigned with a responsive layout, improved spacing, fonts optimized for screen reading, and embedded charts and graphs. We’ve also added tools for sharing via email and social media, and streams that display related content, so that these stories function as a stronger gateway to related research, commentary, and ratings. During user research, we heard from customers who thoughts Fitch didn’t have research or commentary on topics of interest, because the research was displayed near the bottom of an overwhelmingly-cluttered page. We built a new search experience that optimizes how different types of results are presented. Research appears first, and other result types are easily accessible from a bar at the top of the page. Filters were another source of complexity and visual overload, so we made them smarter by showing only the top five in each category by number of results. A person can still access the entire list of filters in a given category, but they choose to do that, rather than having the information presented by default. We also moved the filters to the right side of the page to put the focus on the results themselves. 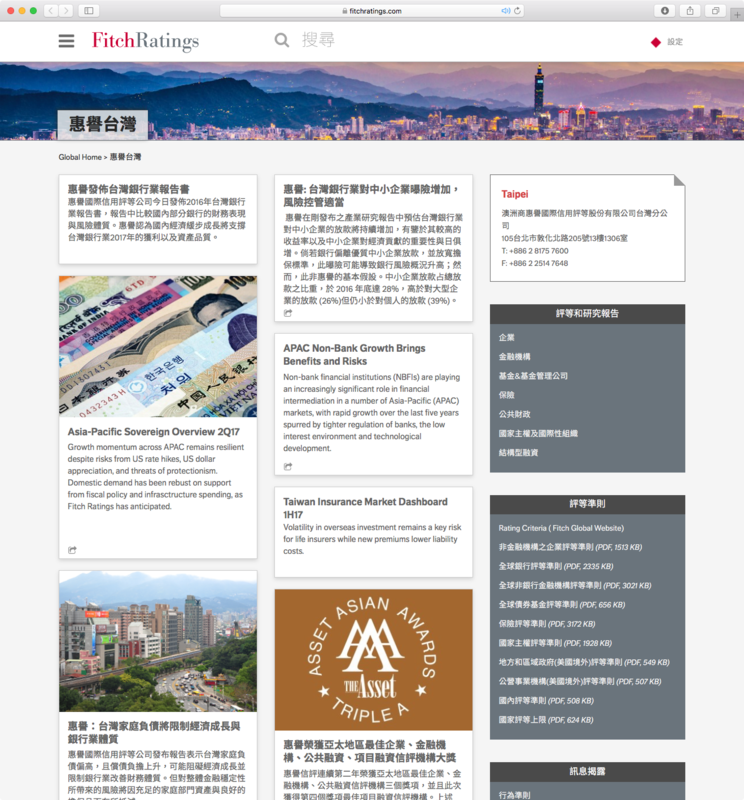 To boost visibility of Fitch’s businesses around the world, I led design and development of new websites supporting multiple languages for subsidiaries in Canada, China, France, Germany, Japan, Poland, Russia, Spain, Sri Lanka, Taiwan, Thailand, and Turkey. To better present Fitch’s insight on industry trends, I led design and development of new data visualization tools, including an Airport Data Map and US Home Price Heatmap. I also introduced tools for building interactive infographics that can be embedded in editorial features, and shared via social media and email campaigns. For example, US States are Experimenting with Cannabis Legalization presents Fitch’s research into the varying regulatory and tax structures employed by US states. 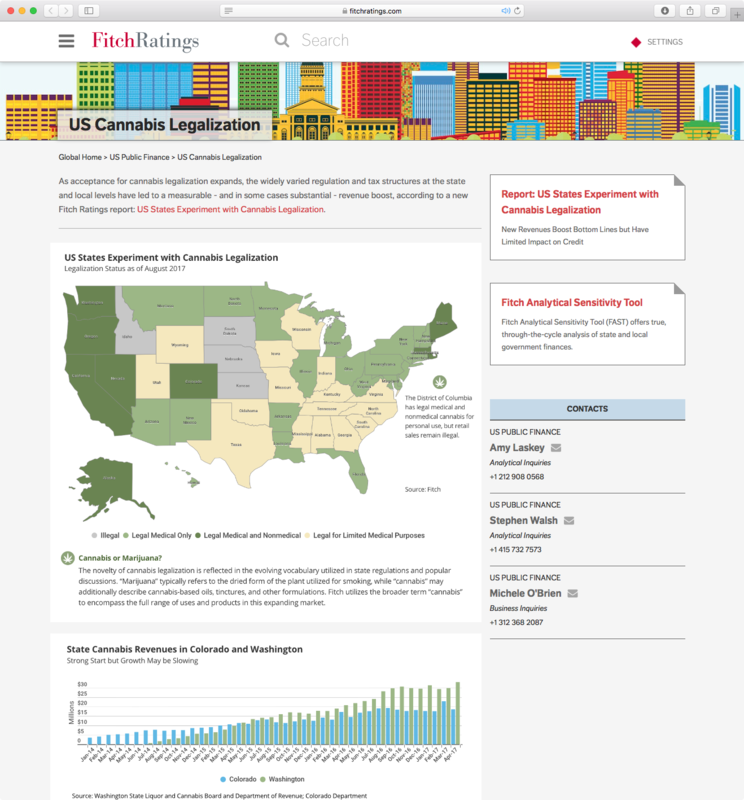 The landing page features an infographic on the status of legalization in all 50 states, along with charts showing revenue growth, tax rates, and market trends in Colorado and Washington, two states that have taken the lead in building legalized, non-medical cannabis markets. To help Fitch compete for top talent, I worked with the Talent Development team to build a new Career & Talent Hub that presents career Openings for experienced professionals, Fitch’s Summer & Associate Analyst programs for current students & recent graduates, and CreditPath, a program designed to help women rejoin the workforce after taking an extended break for family commitments or other personal reasons.